Vishu is the new year in Kerala expected to bring prosperity, abundance, and luck. All icons associated with the festival have the colour yellow. The golden yellow of gold, of the Cassia flowers, of the cucumber, the banana, and the traditional mundu or the sari, holds a tinge of gold making the colour synonymous to this auspicious occasion. Though the new year according to the Malayalam calendar is different, Vishu is celebrated across Kerala as the new year. It holds significance with the myths associated, and the distinct welcome that the season gives. It is the time when the Sun leaves Meena Rasi and enters Meda Rasi, it is Vishu Sankraman and Vishu is celebrated the next day. This is near vernal equinox, one of the two occasions of the year when day and night are of equal length, owing to the Sun crossing the Equator. The preparations for Vishu begins on the eve, arranging the Vishu Kani the first thing they see the next morning. The Kani comprises a mirror, rice, dal, specified vegetables and fruits, ornaments and coins, which are arranged in the puja room. In the early hours, the senior most member of the family wakes up and lights the traditional lamp in the Kani. That person would wake the other members of the family one by one with their eyes closed to the Kani. After the prayer, the oldest member will hand out Vishu Kaineetam. 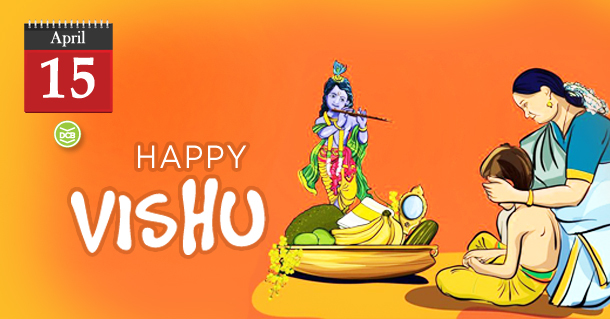 Wishing everyone a Happy Vishu and a prosperous year ahead.